The following morning I was up before sunrise hoping to catch a nice sunrise down at the Grand Marais Harbor. Unfortunately there was no sunrise so I didn’t even take the camera out of the bag. I returned to the hotel to grab a bite to eat before heading up to Grand Portage State Park. 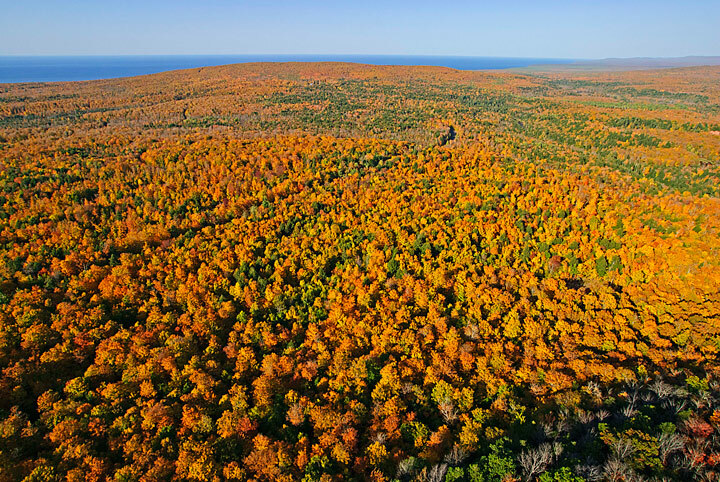 We normally make a drive up to Grand Portage State Park in the spring. On this occasion we wanted to test some gear before heading off to Iceland later this summer. We figured High Falls would mimic conditions in Iceland fairly well. As it turned out we found that it might be difficult to photograph some of the larger Icelandic waterfalls. This photo was taken by my wife on her camera phone. I’ve seen more water flowing over the falls in the spring but I’ve never seen as much spray hitting the viewing platforms. 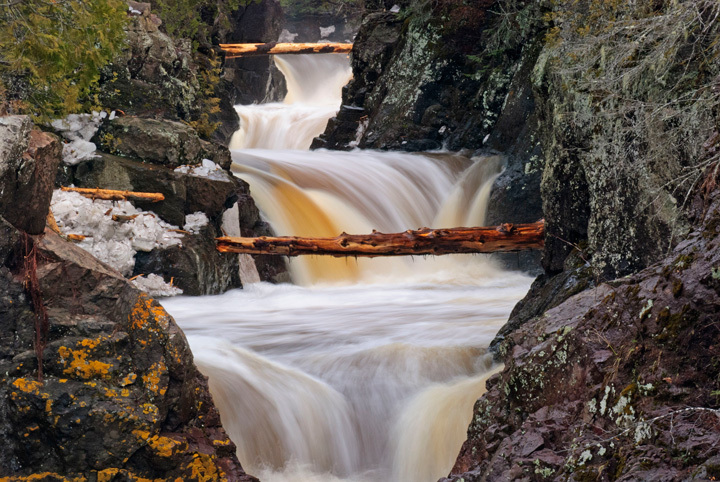 High Falls can be a difficult place to photograph because the falls creates its own weather. Normally you can expect to get wet on the viewing platforms. This is what my lens looked like after a few seconds. We gave some thought of driving over to Canada to view the falls from the other side but it looked like the conditions on the Canadian side were even worse so we gave that idea up. When we returned to the visitors center we stopped to watch a video that Travis Novitsky has created of High Falls during the various seasons. If you stop at the park be sure to watch it. 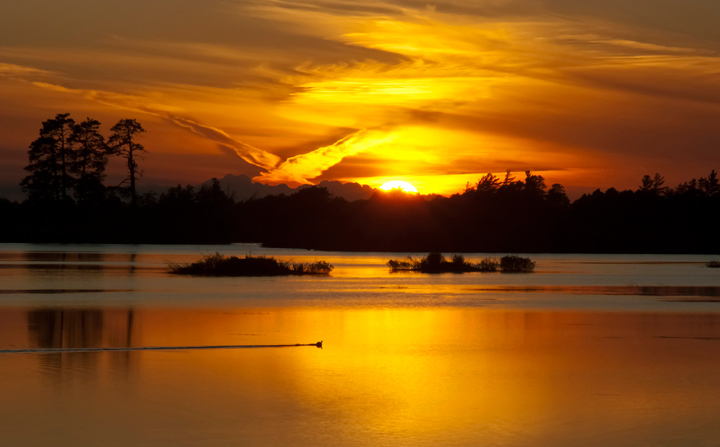 Travis works at the Park and has some great photographs from the far north. The next morning there wasn’t much of a sunrise in Grand Marais so we headed up to High Falls in Grand Portage State Park. 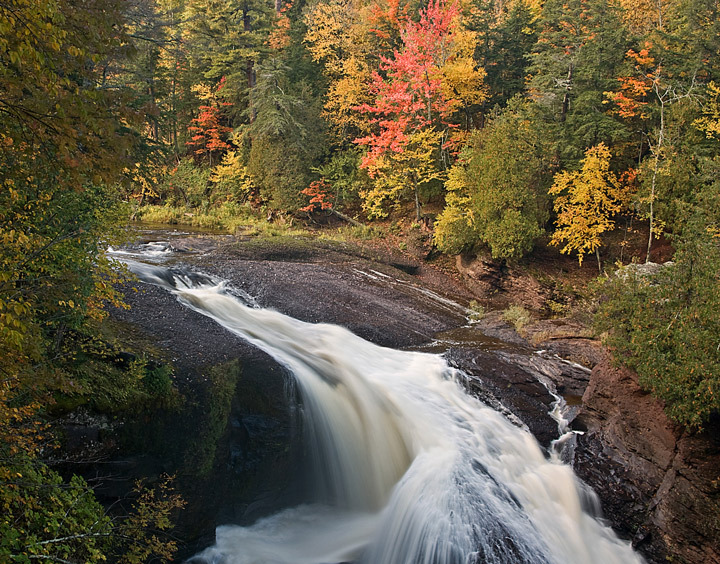 The Pigeon River acts as the border between Minnesota and Canada. Given the low water levels we had seen in the other rivers we assumed that the water flow would be relatively low. In fact it was the lowest I’ve seen it on any of my visits. Typically it is difficult to photograph the falls because of the heavy spray falling over the observation points. It is particular the case in the spring when there is generally a heavy water flow. On this day there was no spray at all. In talking with the ranger, later in the day, she said that it was a very early ice out this year and a low flow spring. 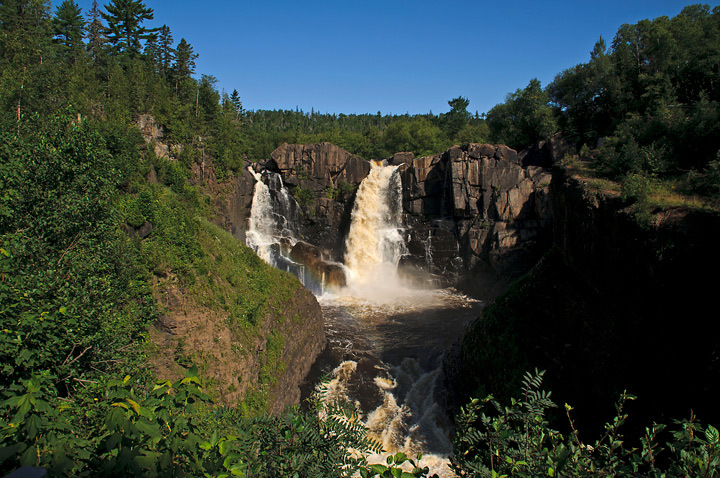 While we were visiting Grand Portage State Park we asked Travis about the trail to Middle Falls. The trail had not been cleaned up from the harsh winter and there were trees down and it was muddy in spots but folks had been hiking to the falls. We had wanted to make this trip so decided to head up to the falls. There is quite an elevation gain on the way out and back but this was a good thing since we were heading to the Black Hills in a week and thought this would be a good way to get in shape. When we reached the falls there was a lot of water coming over the falls. Actually a bit too much to get any really good photos of the falls itself. while we were looking at the falls we noticed some folks taking pictures from the Canadian side of the river. We then notice a road which goes right past the falls. We will leave that for another trip. 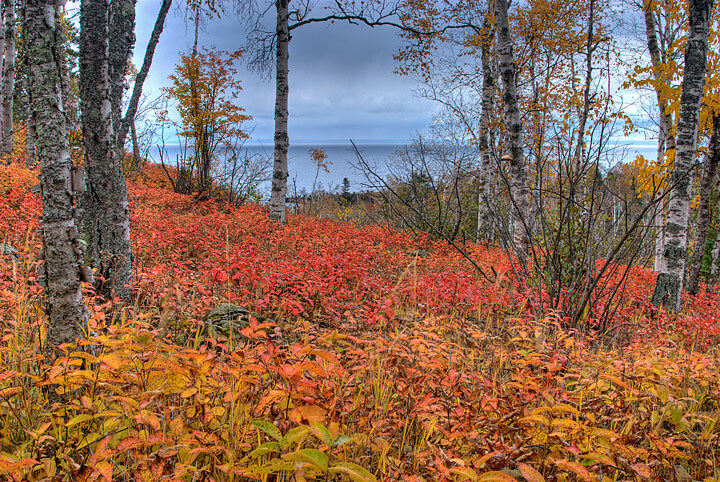 More photos from Grand Portage State Park can be found on my website. 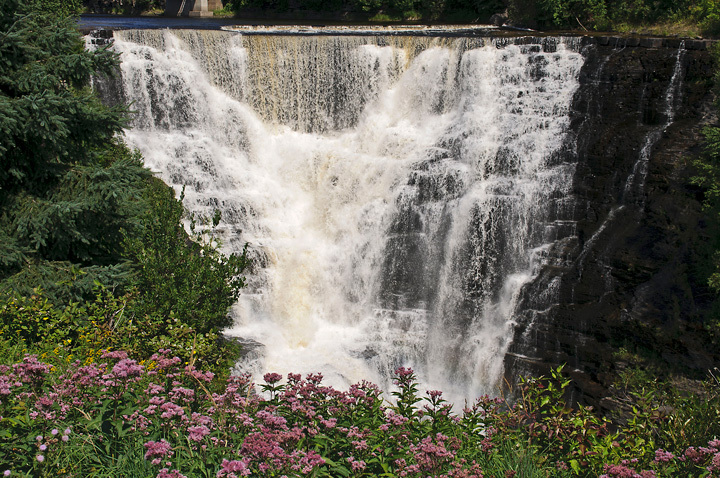 A few weeks ago my wife and I visited High Falls on the Pigeon River located at Grand Portage State Park. There was a lot of water still going over the falls but we were a bit late for the full spring melt. Actually that is a good thing because a heavy water flow makes it difficult to take photos because it is constantly raining on the observation platforms. On this particular day there was a light mist but nothing like it usually is this time of year. We were there early in the morning where there was a beautiful rainbow at the falls. We were fortunate to run into Travis Novitsky at the falls. 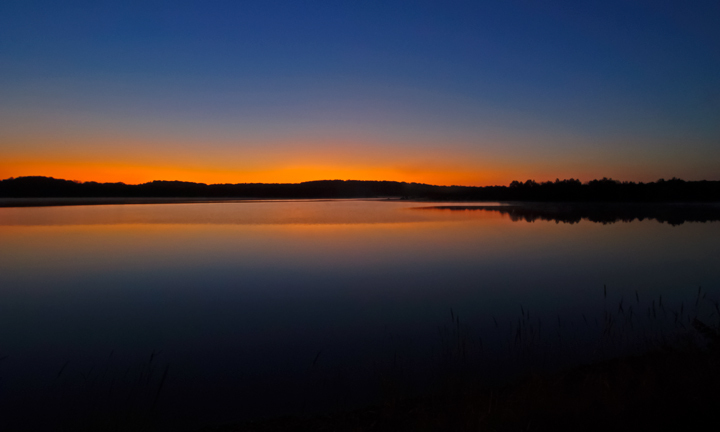 Travis is a self-taught Native American photographer living in Grand Portage and has captured some Beautiful photographs of the area. If you haven’t seen his work check out his website. 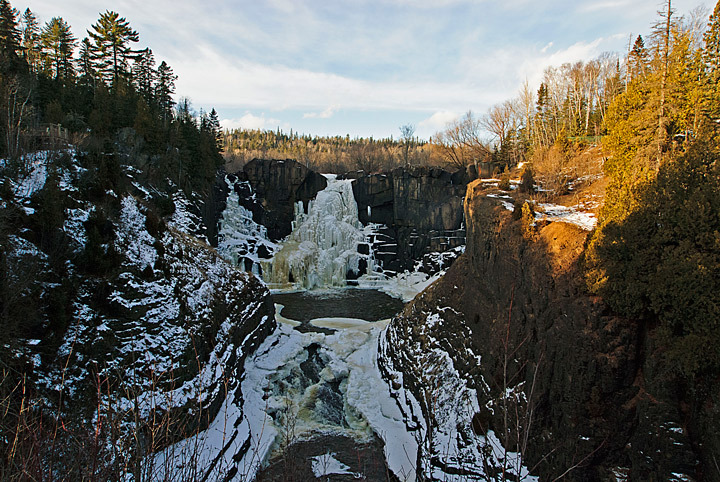 On a recent trip to the Minnesota North Shore I decided to drive up to the Canadian Border and check out conditions at High Falls in Grand Portage State Park. I’ve been to the park in all of the other seasons but never in the winter. It happened to be one of those days when things weren’t going right. When I left home I had forgotten my tripod. On the walk to the Falls I remembered that the camera I intended to use was back in the car. I did have a camera with a wide angle lens so I used it to take a few photos. Fortunately I wasn’t too disappointed because there was not a lot to see at the falls. I would have expected considerably more ice but with the drought the water flow is much lower than normal. As the ranger said someone turned off the spigot upstream. 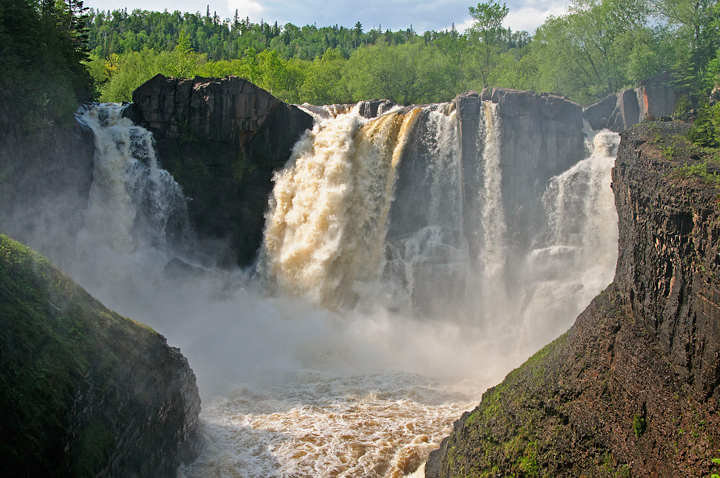 Our destination on the recent trip to the Minnesota North Shore was Grand Portage State Park more specifically High Falls on the Pigeon River. The Pigeon River divides the U.S. and Canada. 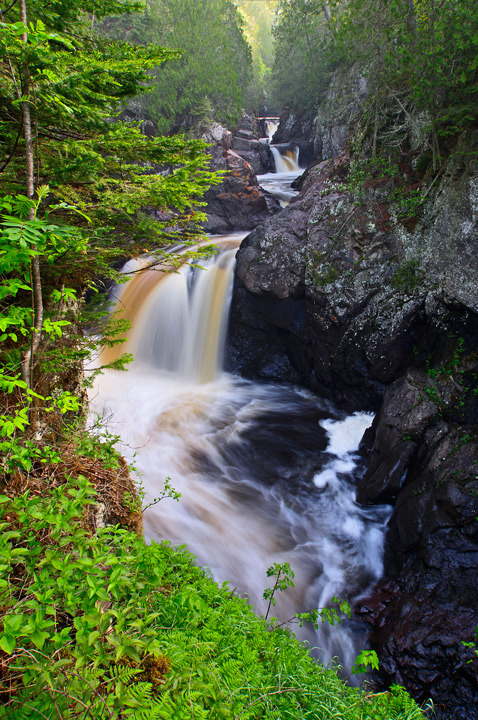 High Falls is the highest and in my opinion the most dramatic waterfall in Minnesota. As we neared the border on the drive up to the falls we stopped at the newly reopened parking lot that has a great view of Lake Superior. It has been under construction for some time and I’m glad to see that is open. 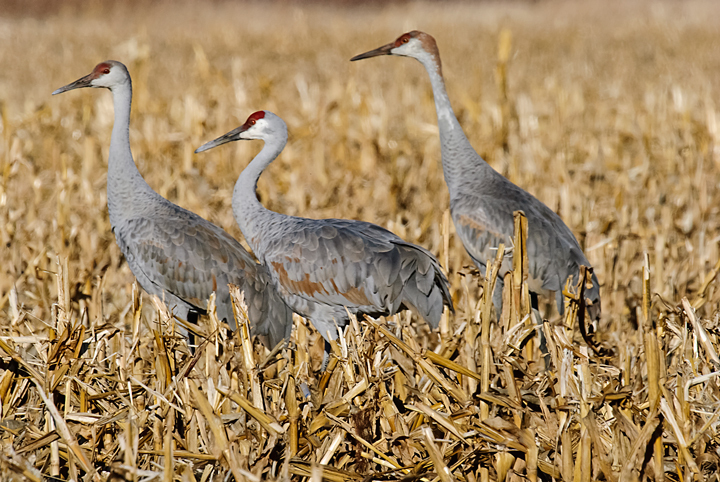 There should be some spectacular photos to be had when the colors turn in the fall. 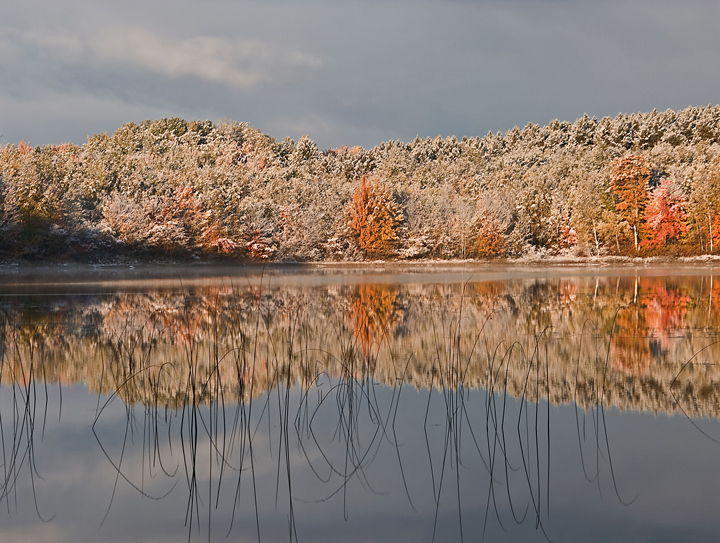 The area is covered with aspen trees. On the hike up to High Falls we could hear there was a lot of water going over the falls. The North Shore had received large amounts of rain the previous week. Water levels were extremely high in most of the rivers during the early part of the week. Although water levels had gone down there was still a lot of water flowing over the falls. There were more people at the park than I had seen in any previous visit. When we reached the first overlook it was crowed so we started with the second overlook. I originally set the camera up with a neutral density filter and a polarizing filter but soon realized there was way too much mist in the air to take long exposures. I went back to my UV filter and decided to shoot freehand. It was a good thing I did because when we went back to the first overlook it was raining. Someone suggested that an umbrella would have been handy but it wouldn’t have helped with photography because the rain was coming up from below with considerable force. 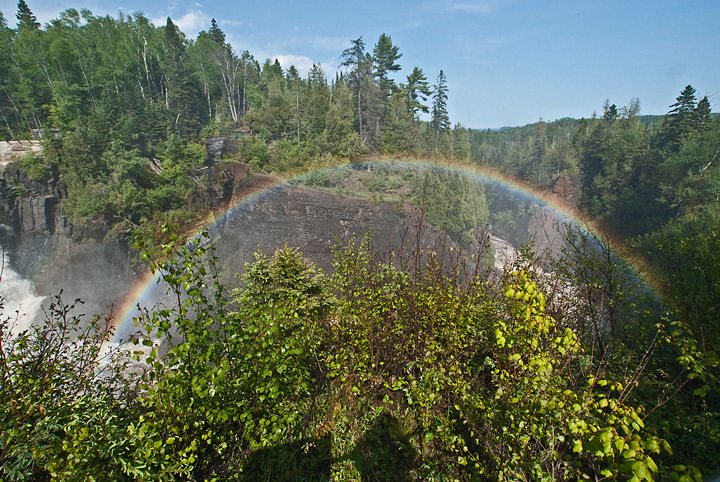 When large amounts of water flow over the falls it creates its own weather system including beautiful rainbows. This was the most water I have seen coming over the falls with the exception of last year when I was there during the spring melt. When there is a heavy water flow it is spectacular at the falls and well worth seeing. If you want to photograph it’s better to time your visit when there is less water flowing so you don’t have to photograph in the “rain”. Actually it wouldn’t be bad photographing in the rain because an umbrella would probably work but it is difficult with rain blasting straight into the camera lens. 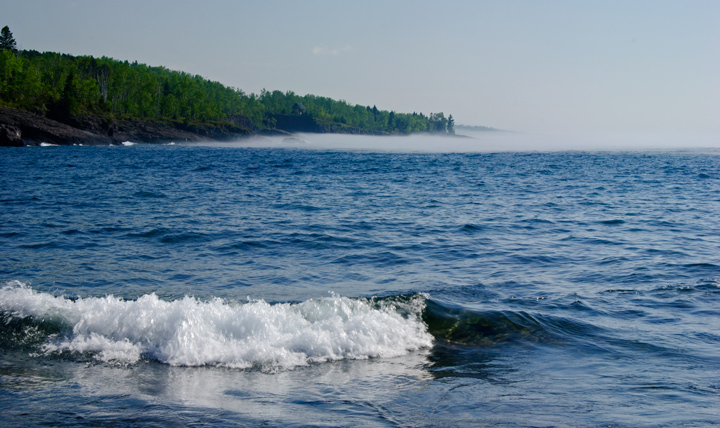 More photos of Grand Portage State Park can be found on my website. This past week we took a road trip up the Minnesota North Shore. This time we didn’t stop at the border and went all the way to Thunder Bay. This was my first visit to Thunder Bay in about fifteen years. As is our normal routine we made our first stop at Amnicon Falls State Park. 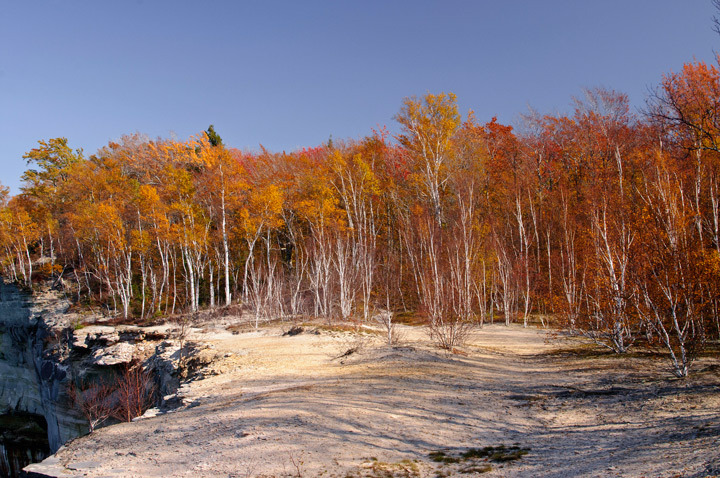 I was surprised to find the water levels in the Amnicon River at a high level. Typically at this time of year they are much lower. Swimming was prohibited in the park because of the high water levels. 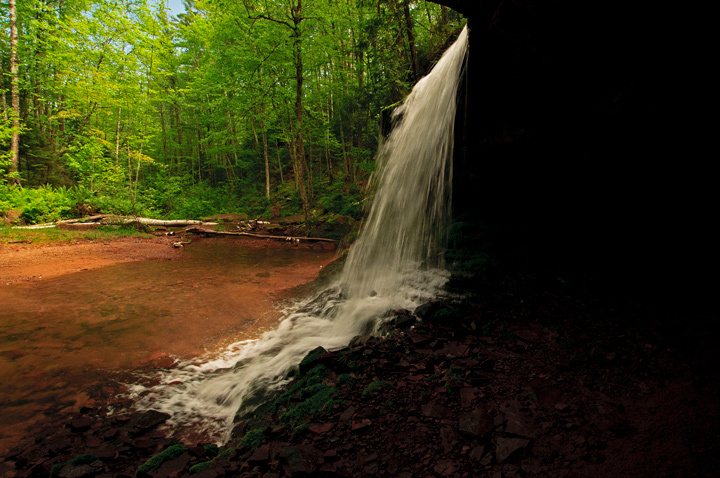 This shot was taken at the top of Snake Pit Falls. Our second stop was Wisconsin Point. This was my second visit to Wisconsin Point this summer. The wind was really kicking up and it was difficult to stand on the breakwater in the strong winds. The water in the bay was really churned up and was a brown color. 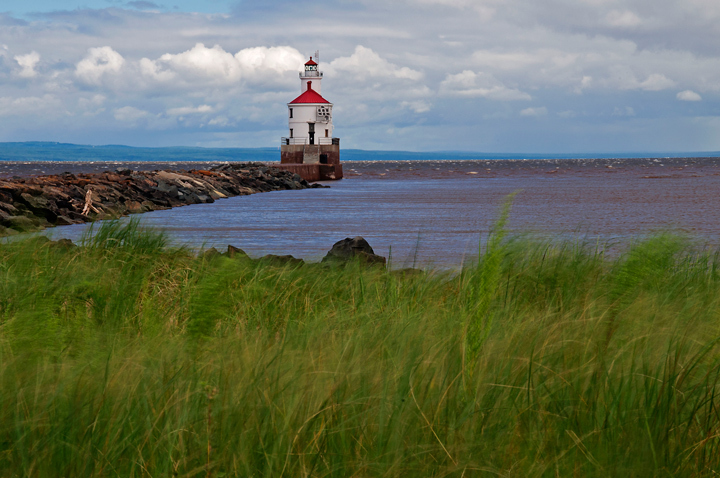 In this shot of the Wisconsin Point Lighthouse you can see movement in the grass from the strong winds. We then went on to Gooseberry Falls State Park. The water levels were really low along the North Shore. 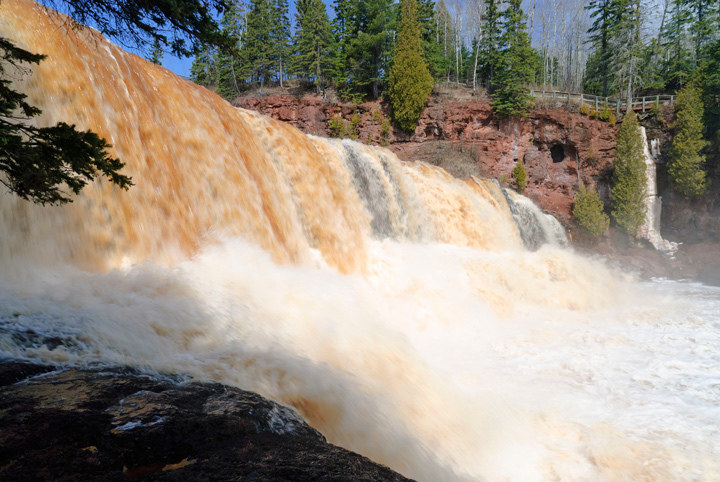 This was a little surprising given the high water at Amnicon Falls. The place was packed with visitors. I would have liked to get some photos of the falls with the lower water levels but it was impossible to take a photo without getting at least a half dozen people in it. This is why I rarely visit the North Shore from mid June until after Labor Day. We then drove up to Split Rock Lighthouse State Park. 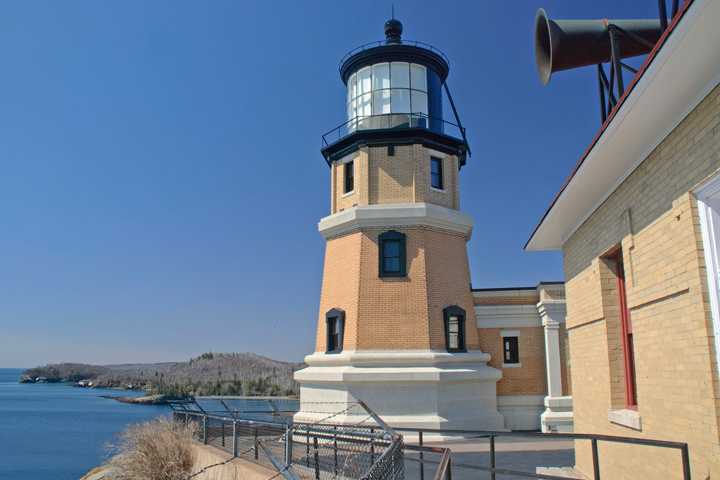 I thought we would have to purchase a park sticker but you can visit the lighthouse without a sticker so we saved a little money. It was really windy at the lighthouse and it was difficult to hear the tour guide with the wind blowing. This photo was taken on an earlier trip. Too many folks on the tour to get good photos this trip. After leaving the lighthouse we encountered some rain squalls on our drive to Grand Marais. There were several rainbows along the lake. One of them lasted from Split Rock to just south of Grand Marais. I’ve never seen a rainbow last this long. We stopped briefly at Cascade Falls State Park. The water levels were low but I find that Cascade Falls is more impressive with less water flowing over the falls. With less water the falls is framed by the black rock surrounding the falling water. 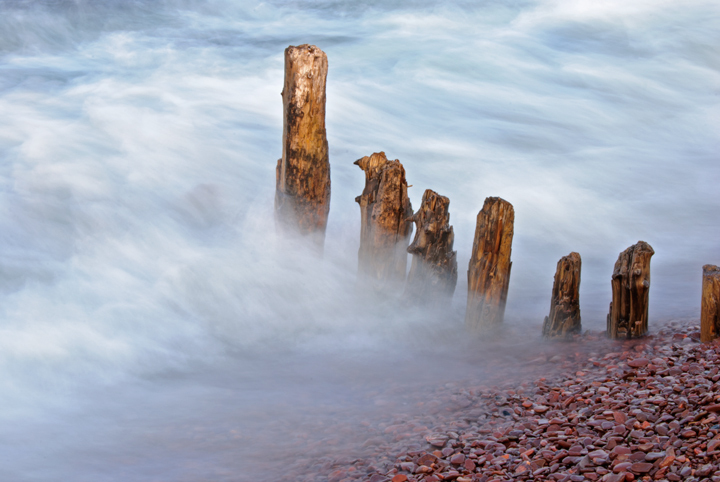 I was able to spend a couple of days shooting in Grand Marais. The sunset was very interesting with a rain squall in the background and a rainbow dropping through the clouds. 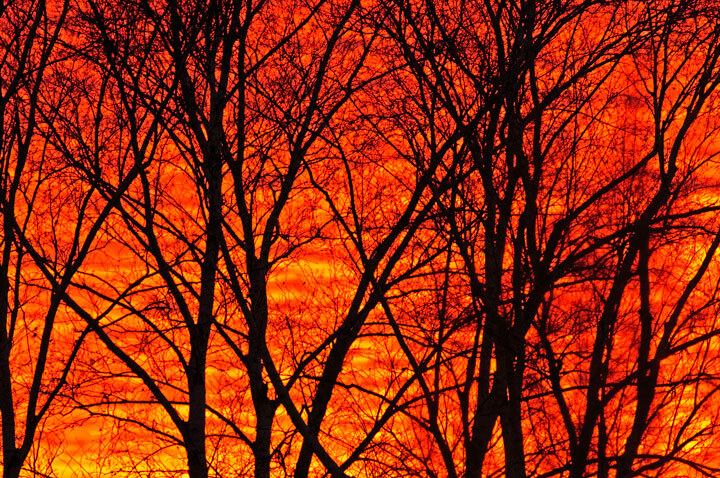 The sunrise was less spectacular with almost no clouds around. 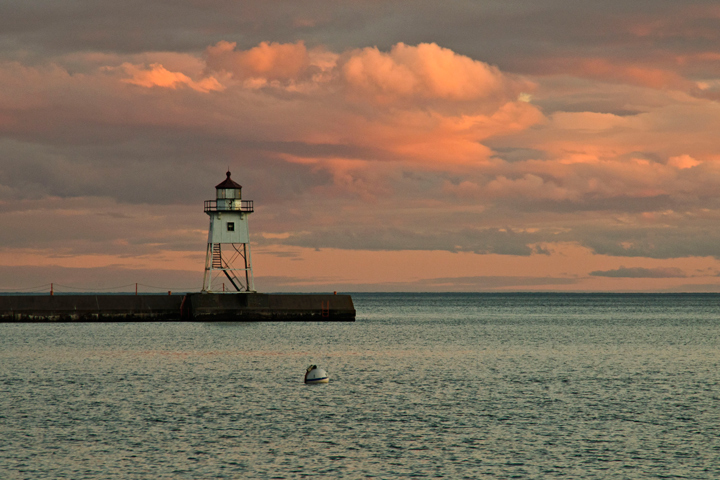 This is a shot of the harbor light with interesting cloud formations in the background. 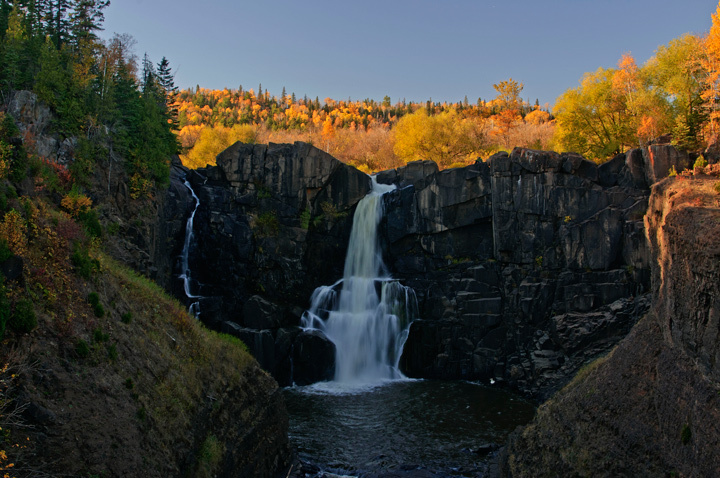 Later in the morning we headed for Grand Portage State Park to photograph High Falls on the Pigeon River. The sun was out by the time we reached the falls. It was a beautiful day and I managed a few photographs of the falls with a rainbow appearing and disappearing at the base of the falls. At Thunder Bay we stopped at Kakabeka Falls. There was not a lot of water coming over the falls. In fact it was extremely dry in the Thunder Bay area. I was also photographing in bright sunlight so the conditions were not the best. You have to pay to visit the park and we had quite a time making our payment at the automated ticket machine. Apparently we don’t get out enough. Fort William Historical Park was on our agenda for the afternoon. We were too late for some of the events but did walk around the park. I have to say that our previous visit when our son was about seven years old was a lot more fun since many of the activities are geared to kids. This is a shot of the fur stores. We drove around Thunder Bay in the evening. I can’t say that I was all that impressed. They are working on the waterfront and when that is done it should be spectacular to visit. 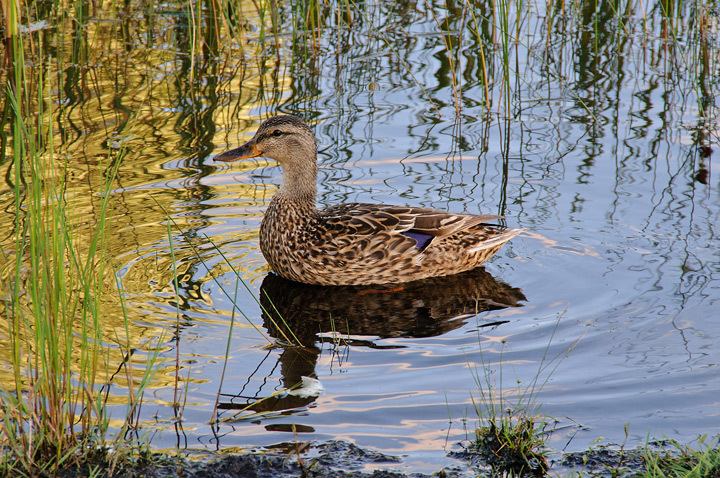 We stopped at International Friendship Gardens where I snapped this photo of a friendly Blue-winged Teal. The next morning we headed back down to the border. 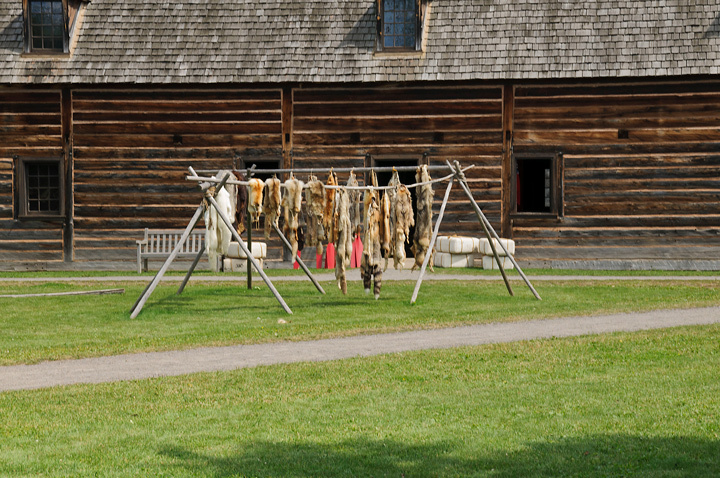 Our first stop was at Grand Portage National Monument in Grand Portage. There is a nice visitors center and a restored fort on the waterfront. Normally when I stop the fort is closed for the season. This time the fort was open and, as luck would have it, Rendezvous Days and a Traditional Pow Wow were going to be starting the next day. About half the participants had already arrived by Thursday so we were able to wander around the encampment talking to folks. 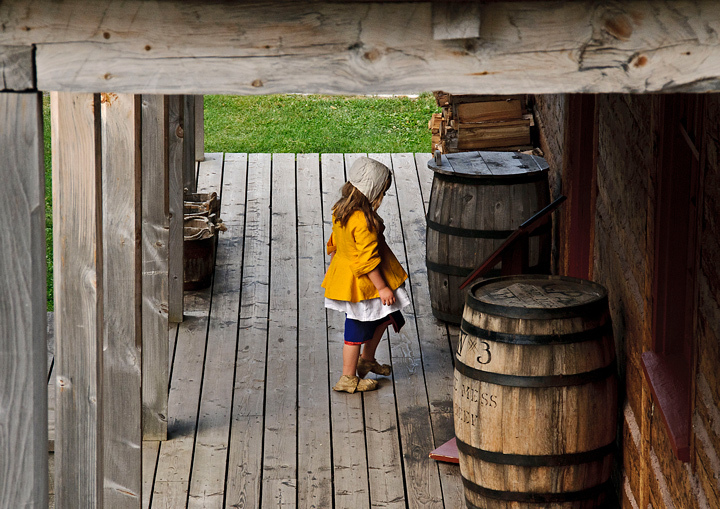 This is a shot of one of voyageur’s daughters entering the Kitchen at the fort. 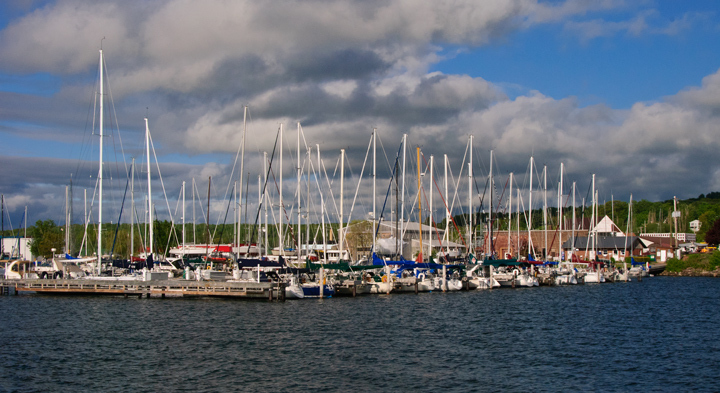 We then headed back to Grand Marais so my wife and her sisters could tours the shops and I could take some photos of the harbor. 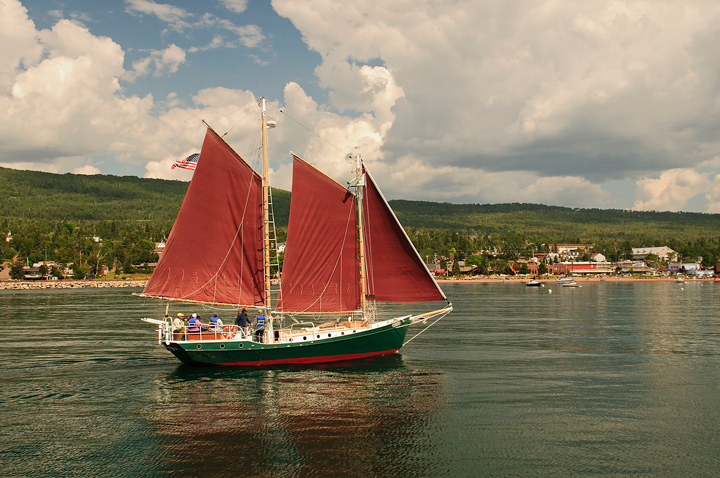 I was lucky enough to catch the schooner Hjørdis sailing into the harbor. 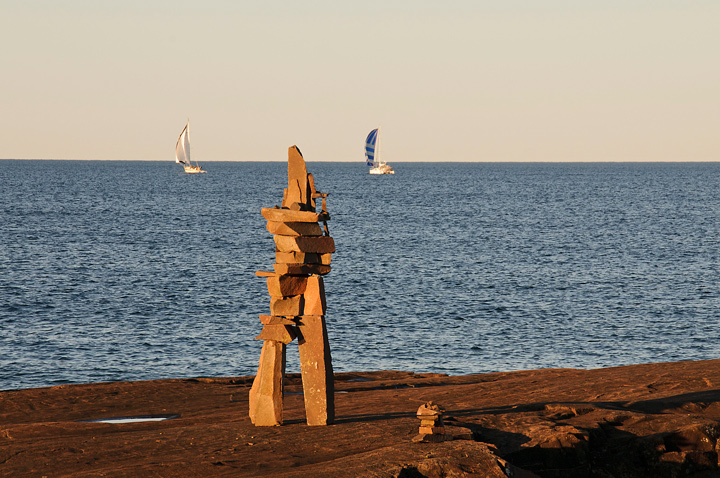 Also in the harbor were lots of Inuksuks. This was a particularly impressive one. We finished off the visit with a lunch at Sven and Ole’s. What to do when it is 100+ degrees out? The first week of June has been really hot. Earlier in the week the temperatures started rising. What to do? I hoped for a late spring blizzard but that didn’t seem to forthcoming. I could stay home and photograph birds from my air conditioned living room but even the birds were saying in the woods where it was cooler. The other option, if you live in the upper Midwest, is to drive up to Lake Superior where it was 40 degrees cooler. I decided it was time for my spring road trip to the Minnesota North Shore. I had planned on going a week later but the chance to cool off couldn’t be ignored. The last thing my wife said to me was to take some warm clothes. Why? it was still in the 60’s on the North Shore. 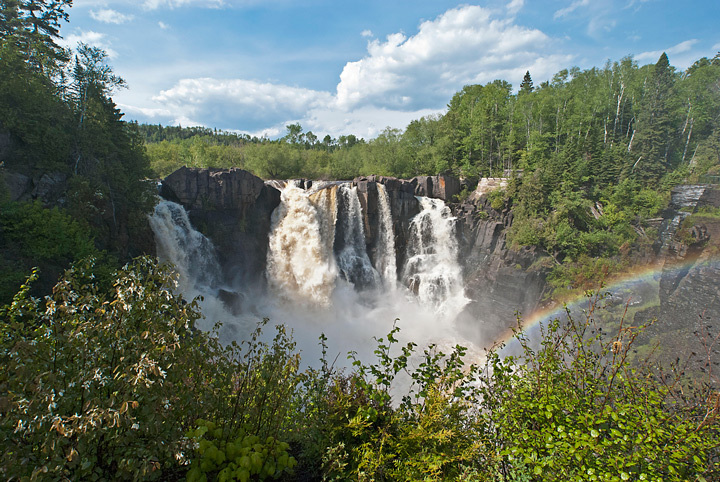 I drove up to the Canadian border to check out High Falls at Grand Portage State Park. 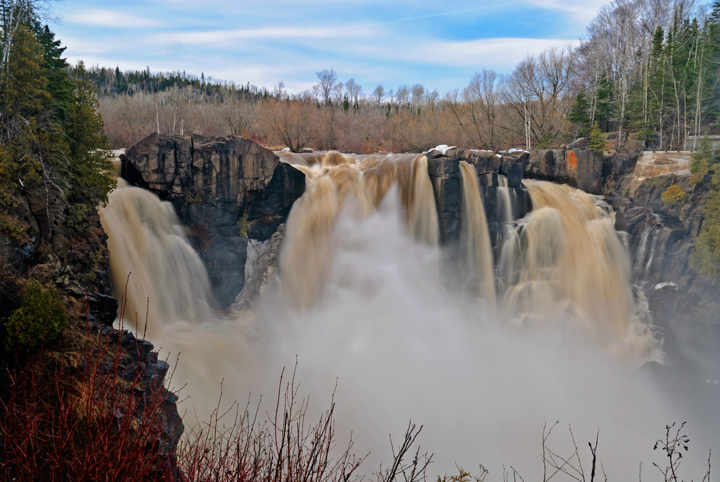 I had visited high falls earlier in the spring during the spring melt and there had been so much water coming over the falls that it was almost impossible to photograph. This time the water levels were considerably lower. Late in the day the sun reaches the trees above the falls but the falls is mainly in the shadows. After photographing at Grand Portage I drove back to Grand Marais, Minnesota to spent the night and hopefully capture some nice sunset shots in the harbor area. Things looked promising during the drive back because it was clear in the west and there were some nice clouds overhead. Unfortunately by the time I reached Grand Marais all of the clouds were gone and it was a drab clear sunset. After a quick dinner at Sven and Ole’s I went out to get some shots at Artists Point. I was a little surprised to find that it was cold really cold. There was a strong wind blowing off of the lake and it felt like winter. Where were those warm cloths I was told to bring? The next morning I had hoped for some sunrise shots but there was a heavy fog over the harbor so I drove down to the Cascade River State park, my favorite waterfall location on the North Shore. I wasn’t disappointed. The water levels were such that photography was good. The fog had burned off by this time but the cascades were still in the shade. One of my usual stops is Sugarloaf Cove. It was a nice day out so I decided to stop and look around. There was still some fog along the coast which made for a nice photo. thought this might make a good shot but didn’t see any place to stop. I turned around and found a place to park and took the trail along the bay to a nice vantage point. I took a few shots and decided to grab something to eat and brought it back down to the lake so I could watch the fog role in and out. 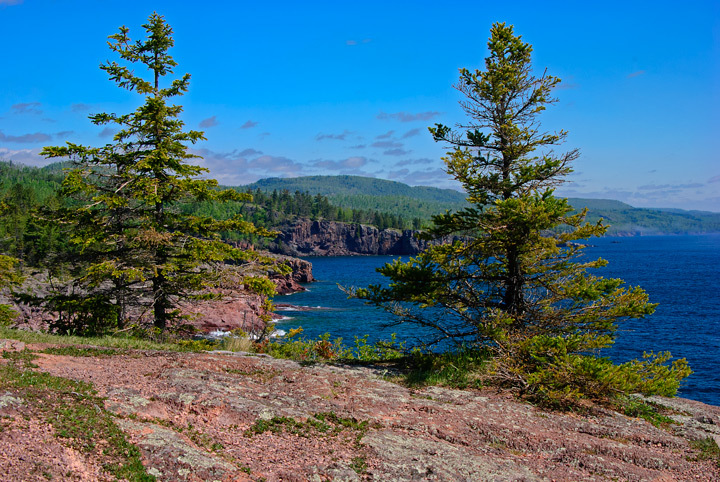 After a relaxing breakfast I headed down to Tettegouche State Park. My wife and I had been at Tettegouche the end of March after the violent spring storm had hit and left much of the lakeshore enchased in ice. It had been a number of years since I had walked out to Shovel Point in the spring so I headed out to see what it looked like without the ice. 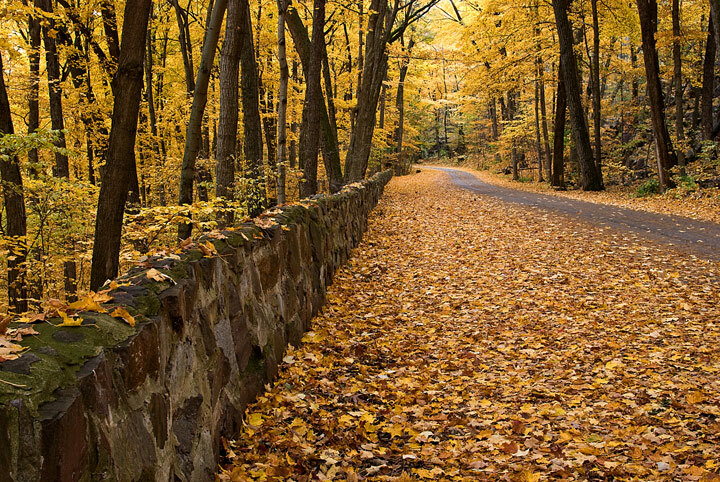 For those of you who haven’t been in the area recently the first thing you will notice is that they are working on the trails and have made some improvements to the trail going down to the lake. The second thing is the arch has collapsed and is now called the tower. This happened last year. It was a beautiful cool day. It didn’t look like the storm have done much damage to the trees. 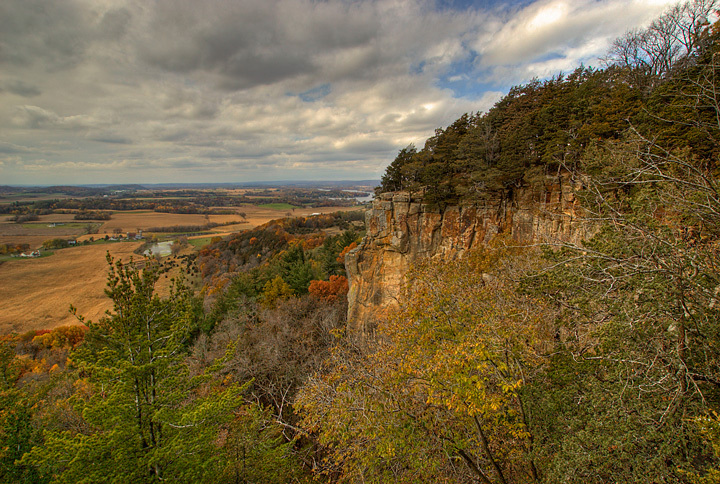 Since it was a bright sunny day I decided to head back toward Wisconsin and drive down to Wisconsin Point and forgo any waterfall photography along the way. 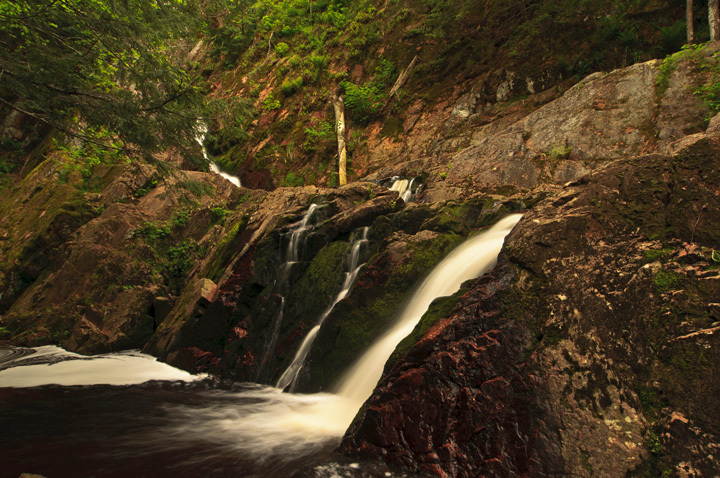 As luck would have it as I reached Duluth the clouds came back making it a great time for waterfall photography. 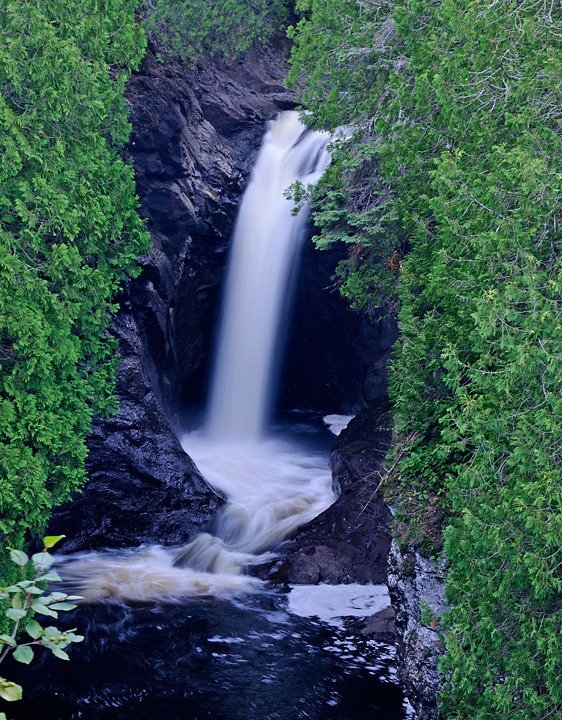 Rather than drive back up the North Shore I decided to stop at Amnicon Falls State Park. I normally stop at Amnicon when traveling through the area. 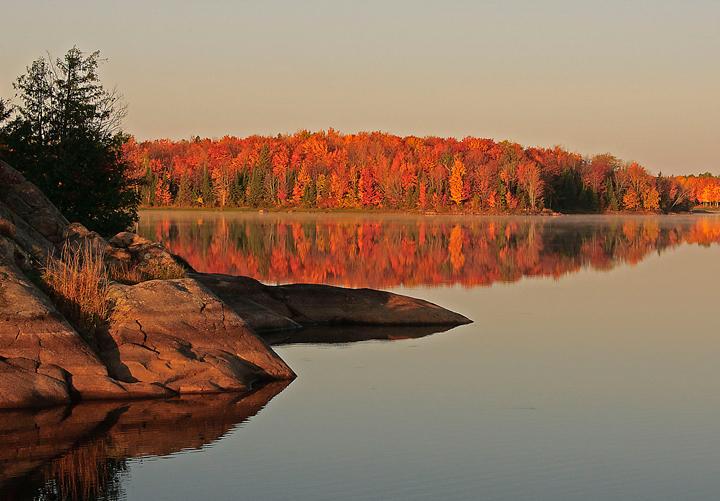 I quickly realized that this is the first time I had been at Amnicon when it was entirely cloudy out. Normally it is a bright sunny day and I have to fight the high contrast light. The light was the best I’ve seen in the park for photographing waterfalls. I lucked out, because a group of kids had just finished swimming in the river so I didn’t have contend with them although there were enough people around that I have to shoot around them. A couple of lovers were particularly annoying because they seemed to want to make out every where I wanted to shoot. After spending a couple of hours at Amnicon I decided to head to Ashland for the night and hopefully some nice sunset shots of the harbor. I arrived about 5 p.m. and concluded that there was enough time to drive out to Morgan Falls and back before sunset. It was late enough in the day that I knew Morgan Falls would be entirely in the shade. Normally Morgan falls has a large violent population of mosquitoes but today things were quiet. Fortunately the only people at the falls were on their way out when I went in so I had the falls to myself. There was a fair amount of water coming over the falls. By the time I had gotten back to the car the clouds had come back and it was completely cloudy so there was no opportunity for sunset photos. I called home to check on the next day’s weather which was supposed to be sunny then partly cloudy. When I woke up at 4:30 it was still cloudy with only a sliver of light in the east. As it turned out if sunset would have been an hour later it would have been spectacular because it cleared in the east with a heave cover of clouds overhead. I decided to drive over to Bayfield to see what was going on. It is still a little early in the season and Bayfield is still a sleepy little town without much activity. That will all change in a few weeks. The light was good with a combination of sunshine and clouds. I walked around town for a while then decided to head down to Little Sand Bay. 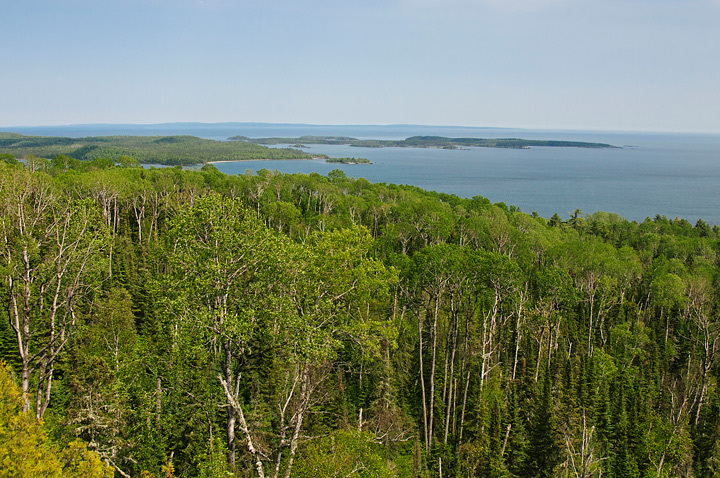 I don’t recall ever having visited the Apostle Islands National Lakeshore at Little Sand Bay and didn’t know what to expect. 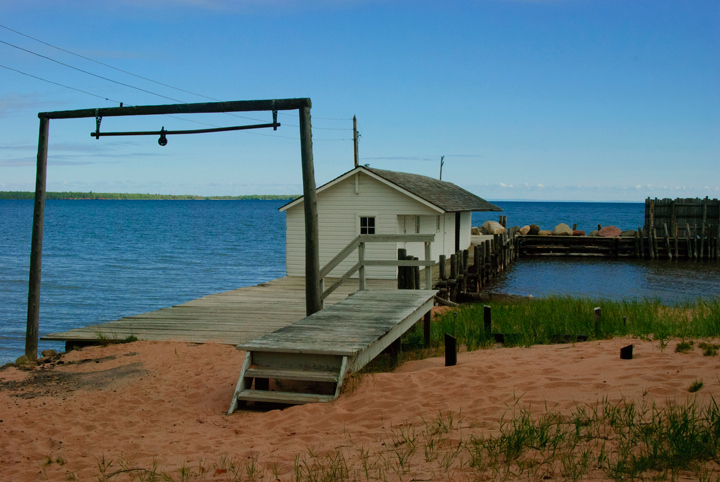 The National Park Service has preserved the Hokenson Brothers Fishery at Little Sand Bay including most of the buildings and some of the equipment. It was well worth the stop. 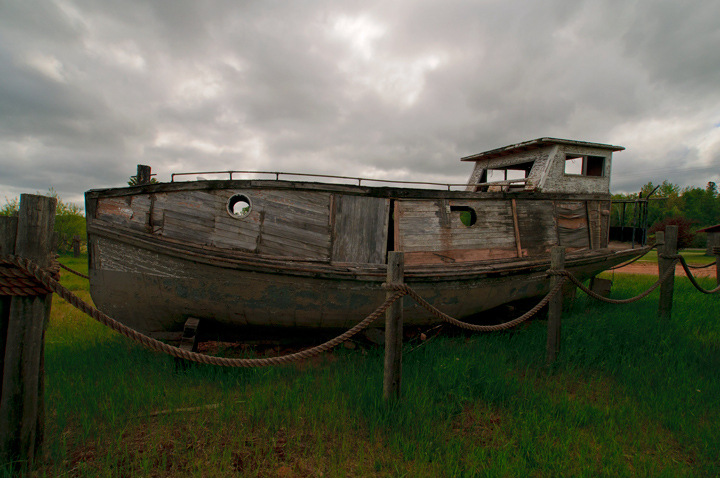 The next stop was Cornucopia and took a few shots of the old fishing boats preserved at a small park in town. There were enough clouds around to make a visit to Lost Creek Falls worthwhile. I was a little worried as I neared the trailhead when I found four cars parked along the road. As it turns out they were four wheeling and had gone on a different trail. There were lots of flowers out along the trail. Most of the way I followed some tracks of a doe and fawn. The trail was muddier than I have ever seen it. I thought this might mean there was a lot of water coming over the falls but that wasn’t the case. The water flow was good but the water level in the pond below the falls was lower than I’ve seen it in some time. It was easy to work around the falls with the low water. The clouds kept moving in and out so I had to spend more time than I wanted waiting for cloud cover. Word was that the warm weather was over so it was time to head back home. 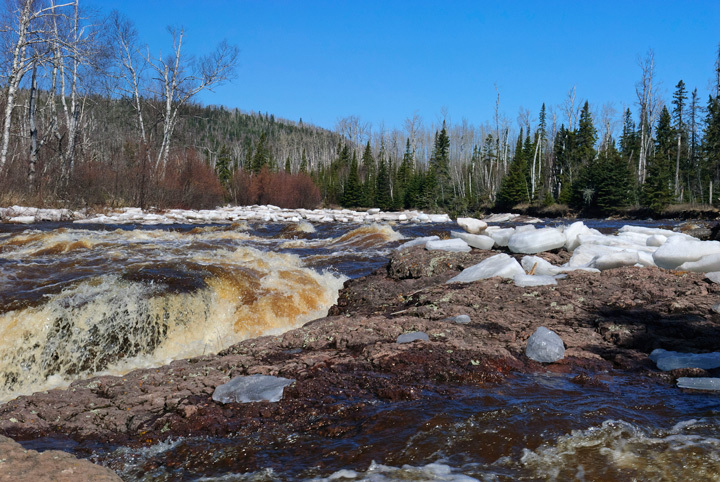 Last weekend I received word that the spring melt was underway along the streams flowing into Lake Superior. 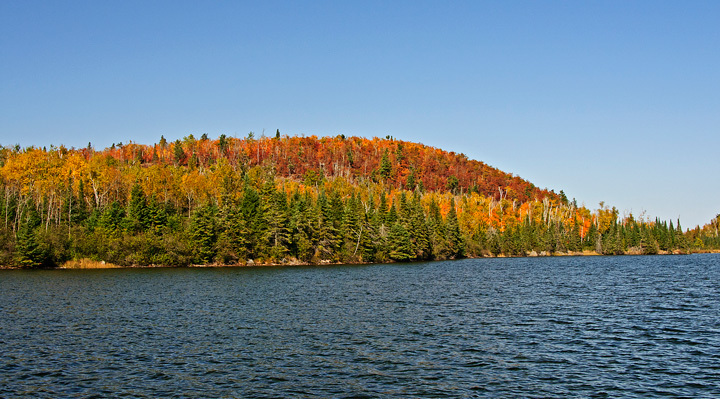 On Monday I headed for northern Wisconsin and the Minnesota North Shore. 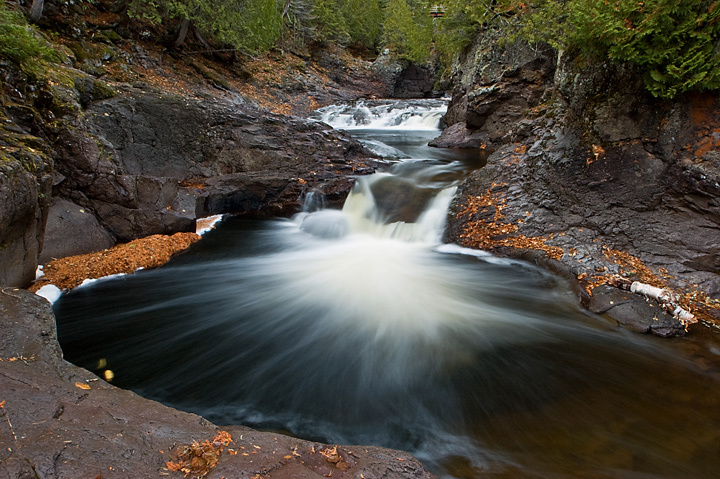 The first stop was Amnicon Falls State Park. I had been in the park two weeks earlier and found the river flowing but still a lot of ice in the river. The river was now open with only a small amount of ice to be found. The water levels were high but I have seen them a lot higher. I managed to find a new shooting location from a gully that leads down to the bottom of Snake Pit Falls. Water was also flowing over Now and Then Falls. I then drove into Minnesota with the first stop Gooseberry Falls State Park. The park had reported that the ice went out during the weekend. Two weeks ago the falls were almost solid ice. The sudden onset of warm weather had resulted in the rapid rise of the water. By Monday water levels were was already going down. 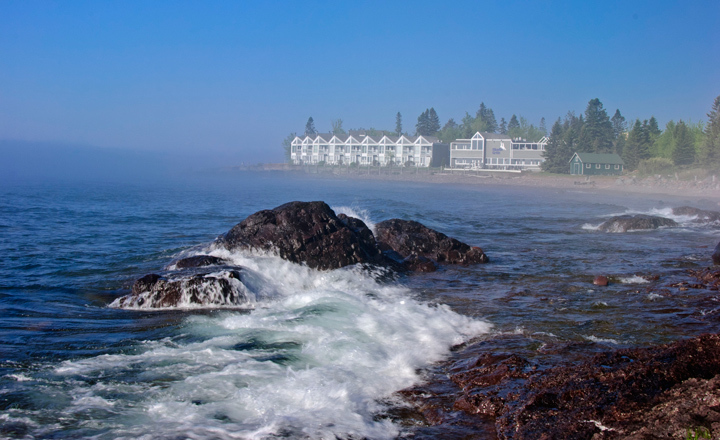 It was a bright sunny day so I headed up to Grand Marais to get a place to stay for the night. I stopped only briefly before heading up to the Canadian border and Grand Portage State Park. 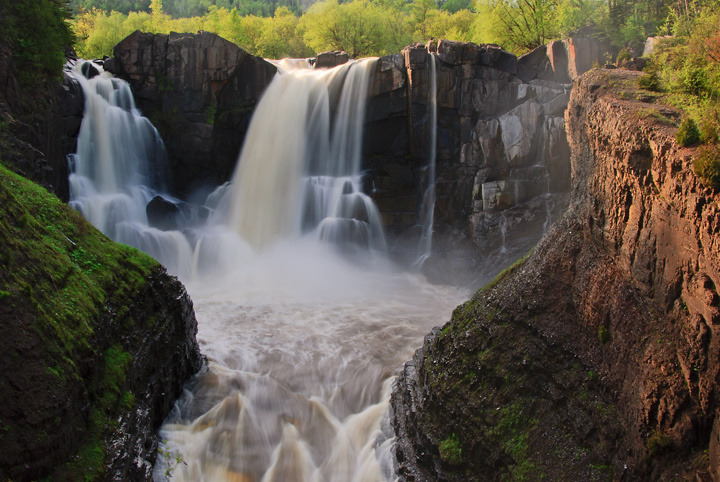 I have photographed at High Falls late in the day with some success even when the sun is out so I had high hopes. As soon as I hit the trail from the visitors center I could hear the falls so I knew something special was going on. The trail in was icy in spots. When I reached the falls there was a lot of water coming over. In fact there was so much water it was creating its own weather system. It was impossible to shoot from two of the overlooks because there was so much spray in the air and it was blowing down the canyon directly into the camera. The first lookout also had spray but it wasn’t constant so I did manage to get some shots. 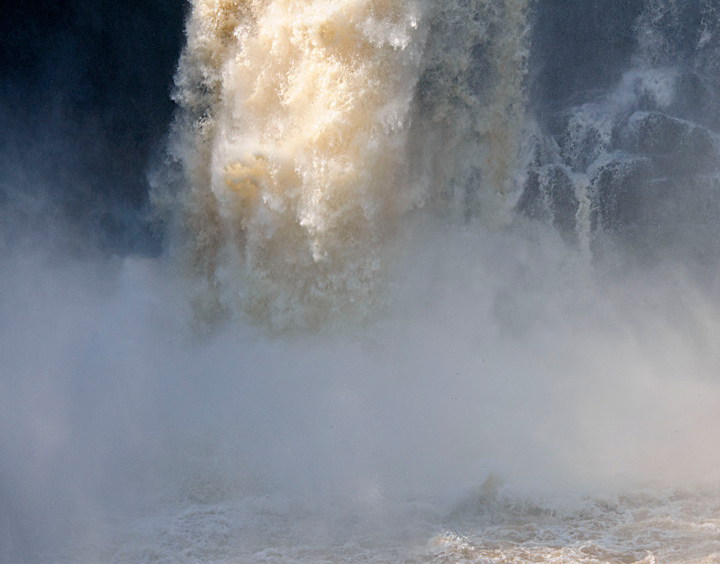 When the water hit the base of the falls it exploded into the air reaching almost to the top of the falls. At one point there were three different rainbows below the falls. After spending some time at the falls and getting more than a little wet I headed back to Grand Marais and a fine dining experience at Sven & Ole’s. By the time I was done eating it was almost sunset so I walked out onto the harbor to take a few photographs. I thought it was going to be a really nice sunset because there were a lot of thick clouds earlier in the evening but they dissipated leaving only a few clouds in the west. 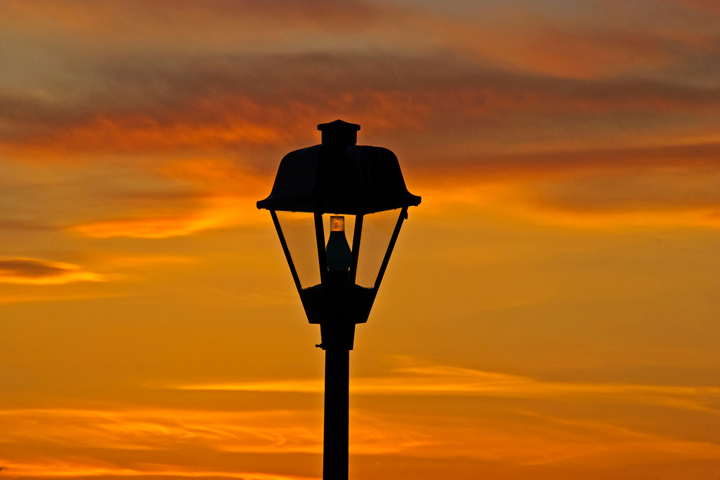 I noticed a Seagull perched on of the harbor lights and tried to get a photo with the sunset in the background. By the time I was ready to take the photo the Seagull was gone but I did manage to get one of the light. In the morning I had hoped to get some sunrise shots but at daylight it was raining out and there was no sunrise shots. After an early breakfast I headed back south. The first stop was Cascade River State Park. The trail was a little icy in spots but I hiked into the cascades. Even though the sun was now out it is possible to photograph up through the cascades early in the morning. There was quite a bit of water flowing but I have seen much higher water at the cascades. Some of the familiar logs that have been jammed in the canyon for several years were missing this year. I then drove on to the Temperance River. Unfortunately I have a habit of driving past this river on bright sunny days. 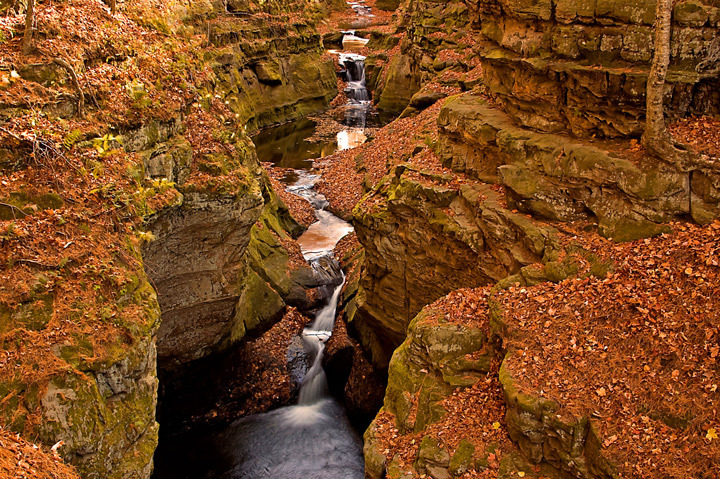 The river consists of some deep canyons that are very difficult to photograph when the sun is out. If you get there early in the morning it helps. Quite a bit of water was running and it made for dramatic views in the canyons. There was some ice on the trail so it was a little tricky getting around. 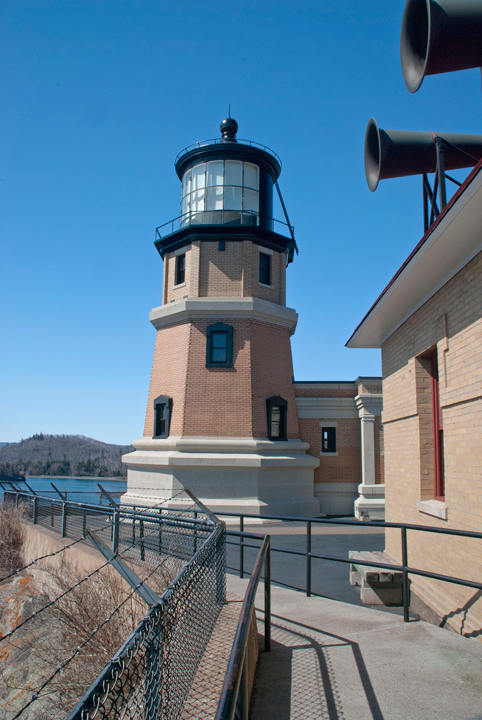 The next stop was at Split Rock Lighthouse to use the facilities and ask about hiking trails north of the Lighthouse. I was more than a little surprised to find the lighthouse visitors center closed. Apparently it doesn’t open until mid May. The gate was open so I wandered around the grounds and took a few shots of the Lighthouse and other buildings. Lunch was at Betty’s Pies. This could get to be habit forming. After lunch I decided I had enough of trying to photograph waterfalls in bright sunlight so I drove down to Wisconsin Point. A couple of weeks ago the ice along the shore was so high that I could hardly see the lighthouse. Now there was still ice along the shore but not nearly as much. Most of it was covered with sand which apparently blew onto the ice from the beach. There were quite a few Seagulls around so I spend some time walking along the beach taking photos of them on the ice. 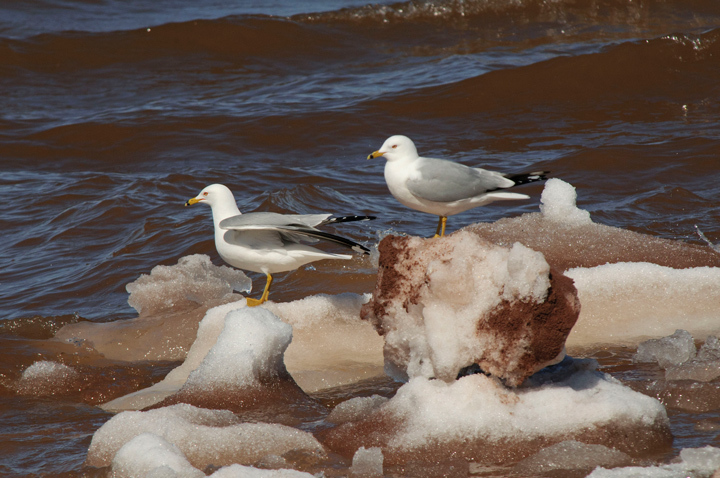 At one point a large section of ice broke off surprising the Gulls. That ended my day and I headed home. 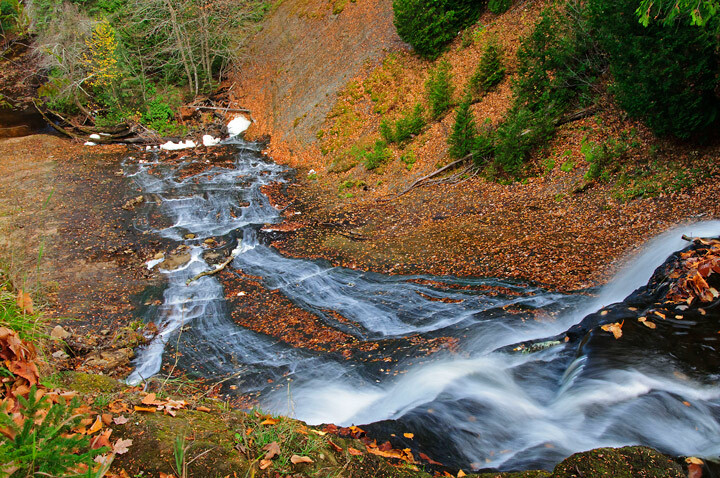 I did conclude that even though it was fun to see the waterfalls during the spring melt I would much prefer to photograph them when the water is lower. Low water means many more photographic opportunities.